Challenger Brinnen Carter closed the gap with Valorie Nelson for the second seat on the assembly, but fell short by 28 votes. 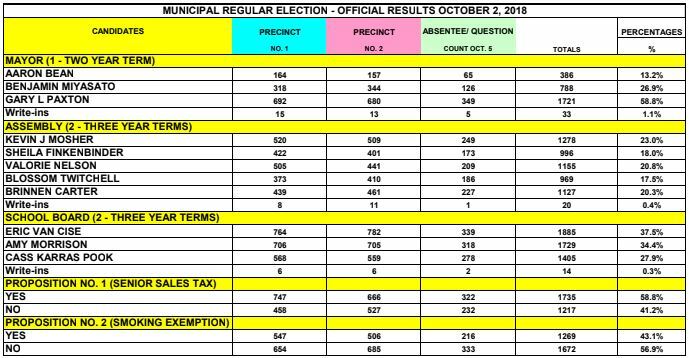 There were no changes in the outcome of Sitka’s municipal election, after absentee ballot counting on Friday (10-5-18). The closest race on election night was for the second seat on the assembly, where only 46 votes separated the leader, Valorie Nelson, from challenger Brinnen Carter. With 566 absentee and question ballots cast, Carter won 18 more votes than Nelson, but it wasn’t enough to overtake her. Nelson will claim the seat with a lead of 28 votes: 1,155 to Carter’s 1,127. Nelson has prior assembly service from over a decade ago. She says her approach to this term will be the same as last time around. Nelson last held an assembly seat in 2005. She had also served as mayor, during the administration of Gary Paxton — who Sitka’s new mayor-elect. Their dynamic was heated at times during that period. Nelson is optimistic that things will be better looking ahead. In all other races, absentee balloting tracked closely with Tuesday’s election. Gary Paxton remains the solid winner in the mayor’s race. Newcomer Kevin Mosher was the top vote-getter on the assembly, taking over 200 more votes than Nelson. Eric Van Cise and Amy Morrison remain one and two in school board voting, unseating incumbent Cass Pook who finished a strong third. Sitka’s two ballot propositions were unaffected by absentee counting as well. Voters approved reinstating the senior sales tax exemption, and chose to adopt the statewide smoking ban — both by significant majorities.